Me: But if one must prove that he or she is saved, “make their calling and election sure,” as Peter tells us to do, then is one’s calling and election complete without works? To use a phrase my mentor, Dr. Ken Keathley, often uses, good works serve as the “evidence of genuineness” of a believer, even though one has eternal security and cannot fall away. While all believers can never fall away, it is important for believers to do good works. If they do not, they prove they are nothing more than fake believers (the theory goes). But in such theology, what does “the necessity of good works” or “eternal security” really mean? If one is eternally secure, “unconditionally elected,” then did God NOT choose such individuals, despite what they have done or will ever do? And if this is not true, and good works are necessary, then is there not a chance of apostasy, since good works are evidence of faith (and apostasy would result due to unbelief)? “Traces of this opinion abound in the New Testament, and the Jewish writers openly avow it. ‘Think not,’ says the Baptist, ‘to say within yourselves, “we be Abraham’s seed,” John 8:33. Comp. Rom. 2:17; 9:6; and other passages, in which Paul argues to prove that being the natural descendants of Abraham is not enough to secure the favour of God. That such was the doctrine of the Jews is shown by numerous passages from their writings. ‘If a Jew commit all manner of sins,’ says Abarbanel, ‘he is indeed of the number of sinning Israelites, and will be punished according to his sins; but he has, notwithstanding, a portion in eternal life.’ The same sentiment is expressed in the book Torath Adam, fol. 100, in nearly the same words, and the reasons assigned for it, ‘That all Israel has a portion in eternal life...’ Justin Martyr, as quoted by Grotiuson chap. ii. 13, attributes this doctrine to the Jews of his day: ‘They suppose that to them universally, who are of the seed of Abraham, no matter how sinful and disobedient to God they may be, the eternal kingdom shall be given’” (Charles Hodge, quoted by F. Leroy Forlines, Classical Arminianism: A Theology of Salvation. Nashville: Randall House, 2011, pages 102-103). “It should be remembered that the principal ground on which the Jews expected acceptance with God, was the covenant which he had made with their father Abraham, in which he promised to be a God to him and to his seed after him. They understood this promise to secure salvation for all who retained their connection with Abraham, by the observance of the law and the rite of circumcision. 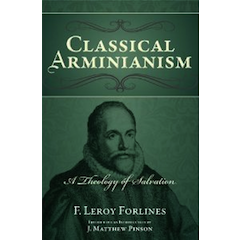 They expected, therefore, to be regarded and treated not so much as individuals, each being dealt with according to his personal character, but as a community to whom salvation was secured by the promise made to Abraham” (Charles Hodge, quoted by F. Leroy Forlines, Classical Arminianism, pages 103-104). “the standard view among Paul’s Jewish contemporaries was that...only those who had refused their inheritance by outright apostasy would be excluded from Israel to whom the promises belonged” (Douglas Moo, quoted by Forlines, Classical Arminianism, page 103). “Every Jew is an organ of the Shekhinah. As long as the organ is joined to the body, however tenuously, there is hope; once it is cut off, all hope is lost” (Rabbi Israel Baal Shem Tov, quoted by F. Leroy Forlines, Classical Arminianism, page 105). “You will say then, ‘Branches were broken off that I might be grafted in.’ Well said. Because of unbelief they were broken off, and you stand by your faith. Do not be haughty, but fear. For if God did not spare the natural branches, He may not spare you either. Therefore, consider the goodness and severity of God: on those who fell, severity; but toward you, goodness, if you continue in His goodness. Otherwise you also will be cut off” (Romans 11:19-22, NKJV). Unfortunately, for the nation of Israel, being God’s people by ethnicity did not give them eternal security before God. They should have learned this to be true from their ancestors whose corpses rotted in the wilderness (Numbers 14:22-35; 26:64-65). In addition, they should have also learned that works could not merit the salvation of God (Leviticus 18:5; James 2:10). The very Old Testament Scriptures they studied on a normal basis also testified to the fact that works cannot merit salvation. Salvation could only be given by faith. This explains why Paul appealed to Genesis 15:6 (Abraham’s faith) in his discussion of salvation by faith, not works in Romans 4. This post was written to examine Jewish theology and provide a background for Paul’s shocking words to the Jewish nation in Romans 9. Might it be said today that some Christians are wrong about eternal security...while others are wrong about the nature of apostasy? That is a question I’ll leave you to answer.